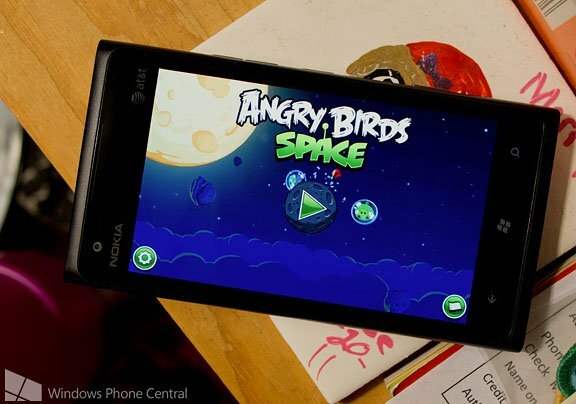 Just as we have seen with Angry Birds Star Wars, Angry Birds Space has joined the Windows Phone 7 gaming lineup at the Windows Phone Store. The Windows Phone 7 version of Angry Birds Space is not an Xbox title, as is the case with the Windows Phone 8 version of the game. Angry Birds Space features over one hundred thirty levels of play pitting your angry birds lineup against space pigs. The Windows Phone 8 version offers over one hundred fifty levels. Beyond that, game play on the two versions is just about the same. Angry Birds Space not only presents you the challenge of destroying the pig's fortifications with a limited number of shots but you also have to battle gravity and the lack of gravity with certain levels. There is a trial version for Angry Birds Space and the full Windows Phone 7 version of the game is running $.99 and you can find it here at the Windows Phone Store.